U.S. stocks ended lower on Friday, as the S&P 500 erased a gain during the session’s final ½-hour. The broad market’s move repeated a pattern that has been in place for over a month in which a week’s final hour of trade experiences intensified volume and volatility, predominately resulting in the downside for stocks. Despite the angst, all three major domestic equity indices posted gains last week, and helped buoy most stocks slightly above breakeven on a total return basis in March. Only the Dow Industrials ended underwater in March. The lackluster finish to the week however, did little to tarnish a strong quarterly gain, among the best of this aging Bull Market in stocks. The S&P 500 surged 6.07% in the first three months of the year, its strongest quarterly advance since the fourth quarter of 2015. For the week, the S&P 500 rose +0.82%, the Dow Industrials added +0.32%, and the MSCI EAFE (developed international) remained flat 0.00%. As Chart 1 above illustrates, the Conference Board’s gauge of consumer optimism (orange line) rose sharply last month, posting its strongest gain in over two years. The Conference Board’s Consumer Confidence Index had previously slowed sharply in late 2015/early 2016 and turned higher in June 2016. The Conference Board tries to gauge consumers’ feelings about the overall state of the economy and their own personal financial situation by focusing on their spending and saving intentions. The Conference Boards version of consumer optimism has recovered more quickly than the University of Michigan’s Consumer Sentiment survey, rising at a 25.8% rate over the past year. The U of Michigan’s Consumer Sentiment Index (blue line), which seeks to gauge consumers’ views of their own finances and their short-and long-term opinion of the economy, rose at a 5.6% rate over the past year, after turning up in November. While both measures of consumer optimism are considered leading indicators, they do not always translate into stronger consumer spending. 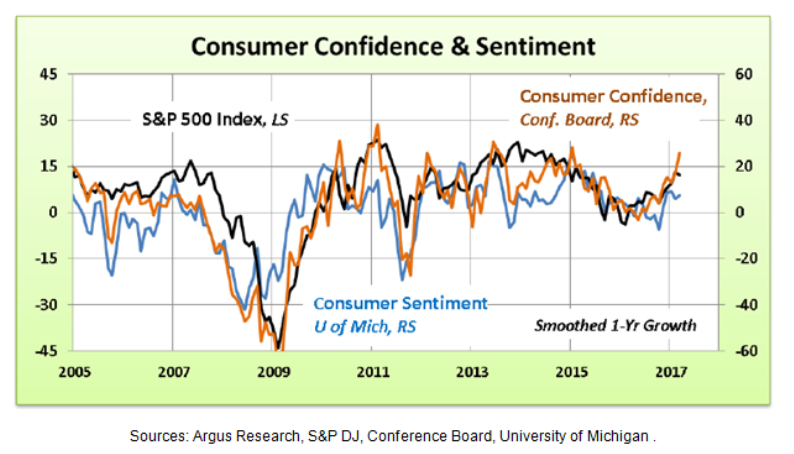 The Conference Board’s confidence index does not always anticipate trends in retail sales but, according to Argus Research, it does tend to move ahead of stocks.